For the first time, the Department of Defense (DoD) is publishing a strategy to transform the way the Department consumes energy in military operations, consistent with 10 U.S.C. § 138c. Section 138c establishes an Assistant Secretary of Defense for Operational Energy Plans and Programs1 (ASD(OEPP)) and directs the production of an Operational Energy Strategy for the Department of Defense. The mission of the ASD(OEPP) is to promote the energy security of military operations through guidance for and oversight of Departmental activities and investments. The DoD Operational Energy Strategy sets the overall direction for operational energy security for the Office of the Secretary of Defense (OSD), Combatant Commands, Defense Agencies, and Military Departments/Services (hereinafter “DoD Components”). Within 90 days of the publication of this strategy, the Department will release an implementation plan, which will include specific targets and timelines for achieving this strategy in the near-, mid-, and long-term. Annual updates to the strategy and implementation plan will include specific performance metrics, as directed by section 138c. Together, these documents will form the basis of the ASD(OEPP)’s annual certification of Departmental budgets, as required by law. Energy security is critical to national security. As described in the 2010 Quadrennial Defense Review (QDR), energy security for the DoD means having assured access to reliable supplies of energy and the ability to protect and deliver sufficient energy to meet operational needs. The Department’s energy portfolio includes the energy used at military installations in the United States and overseas as well as the energy used by military forces in execution of their day-to-day missions. This strategy focuses on the latter. In 2010, U.S. armed forces consumed more than five billion gallons of fuel in military operations. The number one factor driving that fuel consumption is the nature of today’s defense mission. Twenty-first century challenges to U.S. national security are increasingly global and complex, requiring a broad range of military operations and capabilities – and a large and steady supply of energy. • More fight, less fuel: Reduce the demand for energy in military operations. Today’s military missions require large and growing amounts of energy with supply lines that can be costly, vulnerable to disruption, and a burden on Warfighters. The Department needs to: reduce the overall demand for operational energy; improve the efficiency of military energy use in order to enhance combat effectiveness; and reduce military mission risks and costs. • More options, less risk: Expand and secure the supply of energy to military operations. Most military operations depend on a single energy source, petroleum, which has economic, strategic, and environmental drawbacks. In addition, the security of the energy supply infrastructure is not always robust. This includes the civilian electrical grid in the United States, which powers some fixed installations that directly support military operations. The Department needs to diversify its energy sources and protect access to energy supplies in order to have a more reliable and assured supply of energy for military missions. • More capability, less cost: Build energy security into the future force. Current operations entail more fuel, risks, and costs than are necessary, with tactical, operational, and strategic consequences. Yet the Department’s institutions and processes for building future military forces and missions do not systematically consider such risks and costs. The Department needs to integrate operational energy considerations into the full range of planning and force development activities. Energy will be, in itself, an important capability for meeting the missions envisioned in the QDR and the National Military Strategy. The Department’s top mission priority today is to support current operations, and DoD Components should focus their operational energy investments accordingly. The Department also has a duty to ensure the future security of the Nation, making planning and force development an important operational energy focus, as well. The Department has an interest in long-term national energy security and should take steps to work with other Federal agencies and the private sector to diversify and secure fuel supplies. Finally, operational energy is an important tool for strengthening U.S. Alliances and partnerships with other nations, a key strategic goal for the Nation. • Contributing to national goals, such as reducing reliance on fossil fuels, cutting greenhouse gas emissions, and stimulating innovation in the civilian sector. Indeed, the Department can best contribute to national energy security goals by focusing on the core defense mission: to protect U.S. security by prevailing in today’s wars, preventing and deterring conflict, and preparing to defeat future adversaries. In meeting that mission, the Department can provide a strong and sustained pull for innovation, given the scale of military energy requirements and the need to change current energy use patterns. All military operations require energy, and how the armed forces use this “operational energy” can enhance or undermine military effectiveness. Nonetheless, it is new for DoD Components to consider operational energy as a distinct program or capability, rather than a commodity that can be included in military planning as an assumption. The term requires definition. As described in the 2010 QDR, DoD energy security means having assured access to reliable supplies of energy and the ability to protect and deliver sufficient energy to meet operational needs. It is implicit in this definition that military energy security enhances and does not sacrifice other operational capabilities. • Training in support of unit readiness5 for military deployments. Indeed, the armed forces engage in a broad range of training, and it may be difficult to tell which training should be considered operational for the purposes of this strategy. Improvements in operational energy security may mean new equipment, new doctrine, new concepts of operation, or other changes in military operations, and those changes must be incorporated into training in order to be effective and safe for military forces. This strategy applies to any training military forces need in order to incorporate energy security into operations. The goal of this strategy is to assure that the armed forces will have the energy they require for 21st century military missions. To achieve this operational energy security, the Department must develop a diverse portfolio of investments, one that balances near-term priorities for current operations and long-term energy solutions for the future. The Department will concentrate its operational energy investments in the three areas profiled in this section: demand, supply, and future force planning. Rising military consumption of energy is a challenge for the core DoD national security mission. The Department needs to reduce the overall demand for operational energy and improve the efficiency of military energy use in order to enhance combat effectiveness and reduce risks and costs for military missions. Today, U.S. forces are involved in a range of missions, including current operations in Afghanistan and Iraq, humanitarian and disaster relief operations, training exercises, and routine deployments in support of Alliances and partnerships. Many of these missions may involve long distances, rapid deployments, and a sustained presence – all of which require large volumes of fuel. The major consumers of fuel in current operations in Afghanistan are aircraft, ground vehicles, and expeditionary bases. Aircraft and ships account for the majority of the overall DoD operational energy consumption. Moving large volumes of fuel for military operations entails logistical and tactical risks and challenges, and it can also be costly. In 2010, for example, the Department consumed nearly 5 billion gallons of petroleum in military operations, costing $13.2 billion, a 255 percent increase over 1997 prices.8,9 Moreover, given the volatility of oil markets, it is difficult to anticipate and budget for fuel costs. Energy is critical to military capabilities--from the individual warrior to the unit level--in ways that can be independent of the volume of fuel consumed. Compared to aircraft or ground vehicles, for example, a Warfighter on a three-day foot patrol in Afghanistan has a relatively small demand for energy, but that demand has been growing. Today, that Warfighter may carry more than 33 batteries, weighing up to 10 pounds, to power critical gear. By 2012, battery loads for the same mission are projected to increase to more than 50 batteries per soldier, weighing nearly 18 lbs.10 At the battalion level, the Marine Corps has tracked a dramatic increase in energy-consuming equipment, including a 250 percent increase in radios and a 300 percent increase in computers, over the last decade. Moving the energy to feed these capabilities at the “last tactical mile” can be especially challenging. That dependence on regular resupplies can affect the forces that tend to be most directly engaged in the fight. Improved energy performance can therefore help military effectiveness by lightening the logistics load and improving capability, range, and endurance. “Lightening the load” for logistics forces is particularly relevant today. Current counterinsurgency operations and asymmetric conflicts have increased the threats to logistics forces, even as rising demand for energy is increasing the size of the logistics footprint. One result is that from FY 2003 to FY 2007 in Iraq and Afghanistan, a total of more than 3,000 Army personnel and contractors were wounded or killed in action from attacks on fuel and water resupply convoys.11 According to U.S. Transportation Command (USTRANSCOM), ground convoys were attacked 1,100 times in 2010,12 and that may not count movements of fuel at the tactical level, from forward operating bases to patrol bases. In addition to these attacks, the terrain, weather, and political concerns also have been a challenge for supply lines. To cope with such challenges, some energy supplies are re-routed or delivered by air to minimize the risks to convoys and ensure supply. According to USTRANSCOM, air delivery is 10 times as expensive as ground delivery.13 In addition to the costs and strategic challenges such alternatives may entail, the United States may face future adversaries armed with precision weapons even more capable than those of current foes of targeting ground, sea, air, space, or cyber lines of communication. Strategic Goal: Reducing the demand for energy must be the most immediate operational energy priority for the Department. In terms of effectiveness, force protection, and cost, a reduced fuel demand in the battlespace means tactical, operational, and strategic benefits. However, the Department currently lacks sufficient data on and analysis of operational energy use to manage consumption effectively. The Military Services need better visibility into how much energy is being consumed, where, and for what purposes in order to improve operational energy security. There are projects underway to improve DoD’s understanding of operational energy use and its implications, but these efforts are insufficient to date. The U.S. Navy is now investing in monitoring systems, including the Shipboard Energy Dashboard, which will improve data on the Navy’s operational energy consumption. In Afghanistan, where generators account for a significant amount of fuel use, some private contractors supporting military operations have started to install data loggers to record fuel consumed and power produced by generators. The U.S. Army is planning to deploy the Tactical Fuels Manager Defense System in Afghanistan to improve accountability for fuel deliveries under the Army’s supervision.14 The system also can collect data on fuel consumption. Making such common sense steps standard practice is a necessary first step in improving operational energy security. The implementation plan that will follow this strategy sets targets and timelines for the Military Services to improve their data collection on operational energy and to make the data available to the Office of OEPP and across the Services for analysis. With greater understanding of operational energy use, the Department can make more targeted investments to improve energy performance – achieving more military capability per energy input – which can in turn improve military range, endurance, and capabilities and cut operating and opportunity costs. More broadly, the Department must incorporate improvements in operational energy demand into efforts to improve the planning for and management of contingency bases. The means for reducing demand and improving efficiency are both materiel and non-materiel: the DoD Components must invest in new technologies and equipment but also in new practices and behaviors. For example, the Department is considering technological options that will increase military effectiveness and also reduce energy demand, such as unmanned aerial vehicle delivery for cargo. At the same time, the Air Mobility Command (AMC), which operates the airlift and refueling aircraft that are critical to U.S. global reach, is looking at policy changes that will achieve similar ends. These changes, such as reducing aircraft weight by removing non-mission essential items and working with partner nations to fly more fuel-efficient routes, are projected to save $400 million over the next 5 years. These are lessons that can benefit partnerships with other nations, and in some cases, partner nations may have lessons that can benefit U.S. forces. British forces at Lashkar Gar base in Afghanistan, for example, are currently metering all energy consumption as part of their effort to reduce base fuel consumption 50 percent by 2013. »» Work with other DoD Components, under the coordination of the ASD(OEPP), to use consistent and comparable reporting methodologies. »» Integrate improved efficiency and management of energy into planning for and management of contingency bases. Even as demand for operational energy is growing, the reliability of global energy supplies is at risk. The Department largely depends on petroleum fuels for military operations, and the volatility of oil prices will continue to be a challenge. More generally, current patterns of national and military energy supply, specifically of oil, carry strategic consequences. These consequences range from the regional effects of procuring and moving large volumes of fuel through a theater of operations to the geopolitical effects of growing global demand for oil, increasing concentration of supplies, and damaging the environment. Such dynamics can empower transit and oil producing nations, including those hostile to U.S. interests and Allies, and drive market and political volatility.16 Over time, increased competition for energy resources poses risks to international stability.17 For these reasons, current DoD energy use patterns are not aligned with national and DoD strategic goals. The Department of Defense also directly supports military operations from missions located at fixed installations in the United States and overseas. These missions primarily rely on civilian infrastructure for energy supplies, particularly the electrical grid. Such energy infrastructure remains vulnerable to disruption from hazards, including weather, natural disasters, human error, maintenance shortfalls, equipment failures, and attacks on infrastructure, including cyber attacks. Strategic Goal: The Department must take steps to expand its supply options, both for near-term tactical benefits and long-term operational energy security. In particular, diversifying and securing military energy supplies can improve the ability of our forces to get the energy they require to perform their missions. This effort should be second to the top DoD operational energy priority- -the reduction of energy demand--given that the volume of fuel now consumed by military forces is a tactical, operational, and strategic vulnerability regardless of the fuel source. Through the Defense Logistics Agency- Energy (DLA-Energy), military logistics forces, and private sector partners, the DoD goes to great lengths to ensure U.S. forces have a steady supply of fuel for current operations. By the end of 2010, DLA-Energy was moving 40 million gallons of fuel per month into Afghanistan alone. That commitment to supplying the force with fuel will continue. At the same time, the Department will develop and deploy alternative energy that can remove some of the burden from these supply lines, with a focus on energy that can be generated or procured locally or regionally near deployments. For example, Special Operations Forces in northern Afghanistan and a company of Marines recently deployed to Helmand Province, Afghanistan, are evaluating solar-powered electricity generation capabilities.18 The Navy is looking into waste-to-energy technologies that can be installed on ships. More broadly, the Department must incorporate improvements in operational energy supply into efforts to improve the planning for and management of contingency bases. The ability to produce even small amounts of energy at the most forward locations can take pressure off of the most dangerous and expensive fuel supply routes. In addition, U.S. forces “train how they fight,” so operational training must incorporate such energy alternatives, which will have a secondary benefit of cutting military petroleum use more widely. Alternative energy supplies also have the potential to improve partner nation capabilities, including in the civilian sector. Indeed, the technologies most promising for military expeditionary purposes may be well suited for partner nations that lack extensive energy infrastructure. U.S. forces in Afghanistan, for example, have built Afghan National Army outposts powered by solar energy. The U.S. Southern Command is working with El Salvador’s military to install a 91-kilowatt solar panel system that will provide 20 percent of the energy needs at the Cooperative Security Location in Compala, El Salvador. The Department also is taking steps to promote long-term surety of supply. The volatility of oil prices will continue to be a budgetary challenge for the Department, and the realities of global oil markets mean a disruption of oil supplies is plausible and increasingly likely in the coming decades. The Services have already taken steps to certify aircraft, ships, tactical vehicles, and support equipment to use alternative liquid fuels, a prudent insurance policy against future oil supply disruptions and high prices. Although the Department currently procures alternative fuels at a premium for testing purposes, the Department will acquire such fuels for military operations at prices that are competitive with the market price for conventional fuels. The Department also may acquire alternative fuels to meet a mission imperative. For example, U.S. forces in Afghanistan have explored using oil from local crops in U.S. military generators as part of the theater strategy to promote the local economy in Afghanistan. Finally, the Department needs to take steps to improve the security of the energy supply to operational missions at fixed installations, particularly electricity supplies. At some installations, a disruption to electricity supplies of any duration could have an impact on military operations. A long-term electricity outage could undermine DoD’s ability to carry out its core national security mission, including support to civil authorities in a national emergency. »» Establish a joint, integrated policy and investment strategy for alternative fuels RDT&E, with guidance and oversight from the ASD(OEPP). −− Plans for redundancy of critical, operational missions. Although there are considerable potential benefits to improving current operational energy demand and supply, there are also limitations to what such improvements can accomplish. The U.S. military is structured, postured, equipped, and deployed in a way that inherently and increasingly relies on large volumes of energy, particularly oil. Moreover, some military platforms and equipment, especially ships and aircraft, have long life cycles; retrofits can improve but not fundamentally change the energy performance of legacy systems. At this time, the Department is building new vehicles, vessels, aircraft, weapons, and equipment that generally increase the demand for operational energy. Going forward, decisions regarding U.S. force structure, posture, and strategy will have profound implications for energy demand, the ability to assure delivery of energy to forces operating in contested regions, and the cost of operations. Strategic Goal: Energy consumption and the associated costs and logistics challenges must be taken into account in all decisions about strategic planning, structuring, equipping, and posturing the force. All military capabilities consume energy, so the challenge of supplying fuel to deployed forces in any given scenario should be considered, which has generally not been the case. The availability of energy can affect U.S. goals, such as promoting regional stability and the security and prosperity of partners and allies, though energy is not generally incorporated into strategic planning. This is not to say that fuel demand should be more important than lethality, survivability, or any other performance parameters that guide DoD choices about how to equip military forces. Energy resources should not be more important than any other strategic factor that guides DoD decisions about how to employ forces. But the Department must be able to take energy into account in order to make informed decisions about the choices and the tradeoffs in equipping and employing forces. Integrating energy considerations into the strategic planning process will help the military sustain the reach to respond to global challenges and meet strategic goals. »» Emerging technology and DOTMLPF solutions that can be easily fielded to reduce energy use and increase effectiveness. The implementation plan that will follow the publication of this Strategy will include specific targets for incorporating energy considerations into the requirements and acquisition processes. These targets will include tools required by statute, such as the Fully Burdened Cost of Energy. The Department of Defense is committed to defending the Nation in a dynamic security environment. In meeting that commitment, the Department recognizes the role of assured access to and availability of energy in enabling the Nation’s unique ability to rapidly deploy, employ, and sustain military forces around the globe to meet a range of challenges to U.S. security and prosperity. 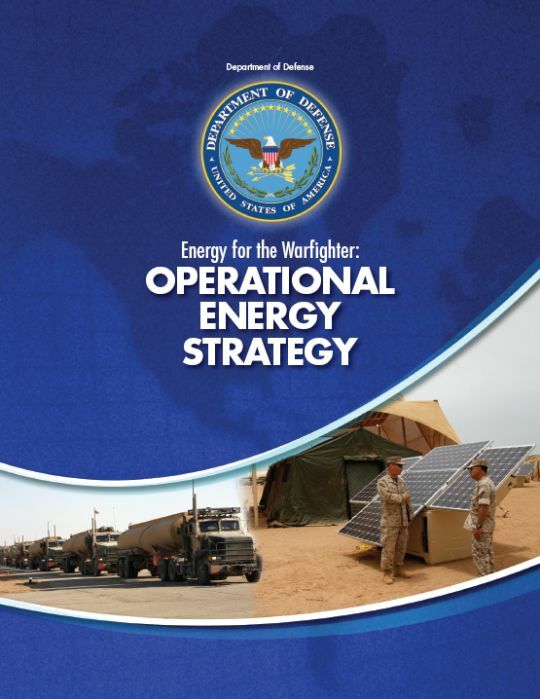 The Operational Energy Strategy provides direction for the Department to improve its operational energy security, both for current operations and in the development of the future military force. Although there is no silver bullet available to address all operational energy concerns, reducing and improving the use of operational energy, expanding and securing the supply of operational energy, and building operational energy security into the future force will enable the Department to achieve these goals. This inaugural DoD Operational Energy Strategy is intended to give DoD Components a common direction and provide overarching guidance. In implementing this Strategy, the Department will seek common goals, programs, and policies wherever possible, while allowing for flexibility and differentiation across military roles and missions as appropriate. Subsequent updates of the Strategy and implementation plan will include specific performance metrics as the Department gains a more detailed understanding of current and anticipated operational energy consumption. 1 The National Security Strategy, May 2010. 2 “Energy Infrastructure and Fuels Required to Support Permanent DoD Installations;” Office of the Deputy Under Secretary of Defense (Installations and Environment), Department of Defense Annual Energy Management Report, Fiscal Year 2009, May 2010; p 9. Updated numbers for 2010 should be released in May 2011. 3 “Readiness” is the ability of operational forces and defense support organizations to perform Mission Essential Tasks in support of the National Security Strategy, the Defense Planning Guidance, and the National Military Strategy. Readiness is based on quantitative measures and subjective assessments of the capability of a unit, formation, ship, weapon system, or equipment to perform its core or assigned missions. Although overall readiness measures personnel, equipment, supplies, ordnance, and unit training, unit training – ranging from ground force units to naval units at sea – is the most relevant measure to consider for operational energy purposes. 4 Deployed locations also may have non-tactical vehicles, such as passenger vehicles or lightduty trucks. Although these vehicles are not considered an operational energy end use on fixed installations, they are generally counted as operational energy end uses at forward deployed locations. Their fuel supply is included in operational energy totals, which are currently calculated by fuel sales figures. 5 The definition of operational energy use for training differs among the Military Services and may need to be further defined in future iterations of this Strategy. The increasing use of simulators for training, for example, may be considered operational in some cases and not in others. In the meantime, most energy consumed at fixed installations is not considered operational in the Department of Defense’s Annual Energy Management report, with the exception of facilities specifically excluded by the Military Services. See page 18 of the annual report at http://www.acq.osd.mil/ie/energy/library/aemr_fy_09_may_2010.pdf. 6 Note that this definition of operational training energy does not rule out the possibility of future performance metrics aimed at reducing the amount of energy consumed in military exercises and other training activities. 8 See DLA Energy FY 2010 Net Sales in Afghanistan, BAH Final Report, December 15, 2010, for general information on fuel sales; data on actual price provided by the Department of Defense, Office of the Under Secretary of Defense/Comptroller. 9 “Rifle Company Power Demands for 72 hours Operation” from Fort Benning Maneuver Center of Excellence, January 4, 2011. 10 Army Environmental Policy Institute, Sustain the Mission Project: Casualty Factors for Fuel and Water Resupply Convoys Final Technical Report, September 2009, www.aepi.army.mil. 11 General Duncan McNabb, Commander, U.S. Transportation Command, remarks at the Center for Strategic and International Studies, February 7, 2011. 12 General Duncan McNabb, Commander, U.S. Transportation Command, remarks at the Center for Strategic and International Studies, February 7, 2011. 13 Refers to non-Defense Logistics Agency capitalized fuel. 14 Doctrine, Organization, Training, Materiel, Leadership, Education, Personnel, and Facilities; the term was developed to inform the Joint Capabilities Integration and Development System, in which the Department determines what the Military Services require in order to meet the goals of national and departmental strategies. The term is meant to encapsulate the building blocks that make up the defense capabilities, and connotes that all the elements of military capability should be considered on an equal basis when considering how to meet military requirements. 15 U.S. Energy Information Administration, Annual Energy Outlook 2011 Early Release Overview; Figure 5, Change in conventional liquids production by top non-OPEC producers, 2009-2035, http://www.eia.gov/forecasts/aeo/pdf/0383er(2011).pdf; shows decrease in production by Norway, UK, Mexico, and Canada, while Brazil, Russia, China, and Kazakhstan (and the United States) increase. 16 National Intelligence Council, Global Trends 2025: A Transformed World, 2008. 17 Admiral Mike Mullen, CJCS, Speech to DoD Energy Security Forum, Washington, D.C., October 13, 2010; http://www.jcs.mil/speech.aspx?id=1472/ and http://www.defense.gov/news/newsarticle.aspx?id=61286. 18 Public Law 110-140, The Energy Independence and Security Act of 2007, Section 526.